Empty Hand Combat is a Kung Fu dojo. We are holding a Spring Break Camp March 25th, 2019 through March 28th, 2019. 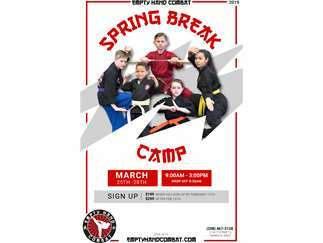 This camp is from 9 am to 3 pm, full of fun games, Kung Fu techniques, learning to use weapons responsibly, how to defend yourself, breaking boards, and meeting new friends. Sign up to do something fun and beneficial for your kids this Spring Break!